Originally Reviewed At: Mother/Gamer/WriterRating: About a 2.7 or 3 out of 5 ControllersReview Source: Publisher/EdelweissReviewer: MeThis goes to show that you cannot always judge a book by its cover or synopsis. 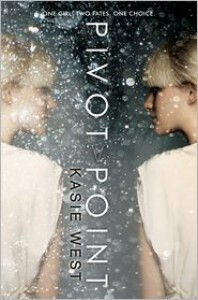 I wanted to fall in love with Pivot Point, a tumbling raging love with its story and characters. However, I came out of it feeling more disappointed than anything. The premise, awesome. The execution, not so much. I tried, desperately, desperately, desperately I tried to connect with the characters and care about what was happening with our main character Addison. And on some level I did I suppose, because I managed to make it to the end. However, every chapter in the beginning ended abruptly for me and it wasn’t until a little over midway through I actually began to enjoy where the story was going. But does everyone want to invest that much time into a novel to get to the good parts? Maybe. Then again, maybe not. Addison lives in a compound with other people who have paranormal abilities. Let’s stop right here. It took me a minute to catch on to the fact that the “paranormal abilities” would always be capitalized in the sentence. Most of the abilities were not even explained well enough for me to care about them. And I kept wondering, how they got their abilities in the first place and why they were all holding up in some compound like they just went around and scooped up every person they could find and dropped them there. I could have really used some more explaining in this department. Especially if you want me to get behind the fact that the whole book is based around her choice to either stay in the compound or go out into the “normal” world. It’s unclear what the whole point of the compound was. Why even write it into the story? It could have been ninjas instead of paranormals and it would have made about as much sense. See my frustration? Moving on, Addie’s parents are divorcing and give her the opportunity to “Search” out her probable futures to see which one she would like to have, paranormal or normal. So, she dives deep in her mind and over the course of too-many-freaking-chapters, she lives out both possibilities. In both scenarios she meets handsome boys and develops feelings for each of them. And everything is centered around football and her best friend, Laila. I think I actually liked Laila better than Addie. Go figure. The only other person in the novel I cared for was Trevor. He seemed really down-to-earth and he was nice to read about. Given everything else that happened in the book, that’s not saying much. Overall, gosh this is a hard one. I know some people will like the chapter switching and love interests. But I can’t help but feel Pivot Point could have been so much more than it was. Like I said, it’s not overly bad, though it’s not particularly good either. It’s one of those middle-of-the-road reads with tons of potential and not enough OMG or WOW. You will either really like this one or you won’t. I’m interested to see how others perceive this strange book. I almost DNF’ed it but decided to keep going since I’d made it to the halfway mark. There will be a sequel, but I will not be picking it up.